The top floor of Upper Belvedere has only a few rooms, but uses them to show the transformation of Austrian (and European) art from the benevolent domesticity of Biedermeier painting to the modern era. As always at Belvedere, there are many bright jewels to capture the eye. As with the other permanent exhibitions, the top floor at Belvedere uses each room to present a particular theme, whether a genre (e.g. 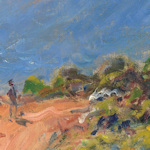 Realism & Impressionism) or a topic (e.g. Austria in Transition). The works present a chronology, illustrating the evolution of styles in Austria from the gentle domestic scenes of the early 1800s through to abstract works of the 20th century. And some familiar names appear as you go around, both Austrian (e.g. Waldmüller or Schiele) and international (e.g. Manet and Monet). The wide scope of the exhibitions exceeds the ability of this ignorant writer to identify the approved highlights. But this is what grabbed my attention on my last visit. Given the whirlpool of modern politics and the spiral of chaos we seem to find ourselves in, the paintings from the Biedermeier period exude a welcome tranquility. In particular, Franz Eybl’s 1850 A Girl Reading projects a seemingly long-gone innocence. Though, of course, it’s all illusory, as shown in the single counterpoint to the happy domestic scenes on display: Ferdinand Georg Waldmüller’s 1854 Exhausted Strength. A single mother lies barely visible on a darkened floor beside her child’s cot…a pinch of realism in the Biedermeier art world. 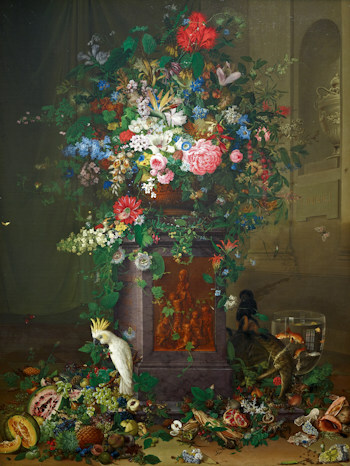 Johann Knapp’s 1822 painting Homage to Jacquin (pictured above) is both beautiful and full of science, featuring plants from all 24 classes of the Linnaean system. It doesn’t take long to zip around the few rooms, but it’s a nice little foray through art history and offers a little breather from the inevitable crowds one floor down in the Klimt galleries.